You’ve decided that installing a stair lift in your home is the right move. But now you’re faced with the perplexing task of choosing the right unit. You need to find one that fits both you and your space and comes from a reputable company. Examine the space to ensure it’s suitable. Find a reputable stair lift company. Decide on the type of stair lift you need. Consider which features are important. Check the warranty and service policy. In this post, we’ll cover each of these steps in more detail, so that you end up with a stair lift that’s right for you. While most staircases are good candidates for housing a stair lift, not all are suitable. For example, if your stairs are narrow, there might not be enough clearance for your knees once the lift is installed. What’s more, depending on the surrounding area, certain types of stair lift might not work in a given space, such as where there’s a door close to the top or bottom of the stairs. Although, don’t give up too quickly as some adaptations are possible, such as the use of a flip-up rail (more on that below). 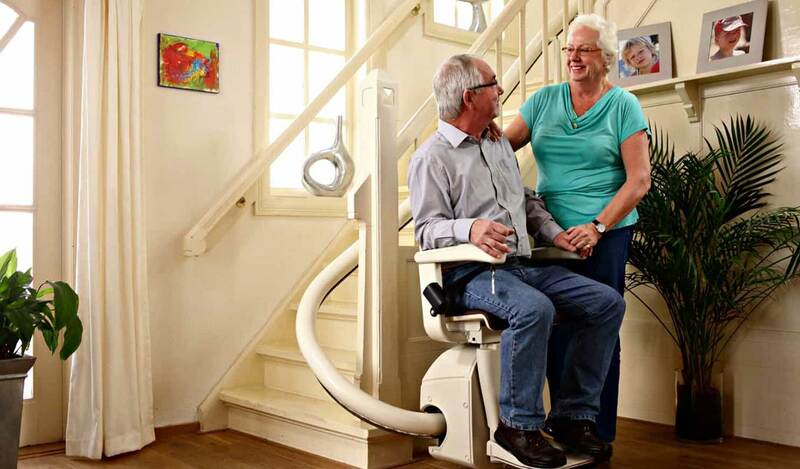 If you decide that a stair lift won’t work, there are other home mobility solutions available. For example, you might consider installing a home elevator or modifying the home to limit the need to use the upper level. There are many stair lift companies out there, but they’re definitely not all comparable. Stair lifts are a very personal purchase, so you need to find a dependable supplier that is able to offer a highly-customized service. You also need to work with someone who is knowledgeable and caring, and able to offer you peace of mind. With so many options available, how do you know where to start? You can ask friends or family if they’ve had good experiences in the past or check out unbiased directories such as ConsumerAffairs. If you have just one set of straight stairs, then a straight stair lift is likely a good option. For a set of stairs that is completely curved, a curved stair lift will be your only choice. If there are two or more sets of stairs with a landing in between, a curved lift is ideal. You could use multiple straight stair lifts and transition between them, but this could be awkward or dangerous, depending on your mobility. When it’s not in use, you may wish to position the unit around a corner at the top or bottom of the stairs. In this case, a curved stair lift would be the option to go with. There are other scenarios where a curved lift might be beneficial, depending on the surroundings. You can work with your supplier to choose the right one for your home. Swivel seat: This can make it easier to get on and off a straight lift as you can face the top or bottom of the stairs. Harness: Stair lifts come fitted with a seatbelt, but a harness might be desired for additional support and safety. Flip-up rail: If you have a door or high-traffic area close to the bottom of the stair lift, a flip-up section of rail can help to overcome the issue. This simply flips up when not in use so it’s not causing an obstruction. Diagnostic display: If the unit requires servicing, this can tell you what the issue is by displaying an error code. Aside from choosing your features, you also need to make sure you find a lift that fits. Pay attention to specifications such as weight capacity and seat width, and try out some units in a showroom to see which models are most comfortable for you. An area that many people overlook when purchasing a stair lift is the warranty and service policy offered by the supplier. Any company worth their salt will back their product with a warranty, and will assure customers by providing annual servicing and covering the cost of repairs. Once the warranty expires, service, repair, and replacement costs will need to be covered by you. Many lifts come with a standard one-year warranty, but you can often extend this for an additional cost. Warranty features and prices will vary depending on the supplier. Make sure this is one of the first questions you ask when choosing a stair lift company. Plus, review the warranty and service policy carefully before signing off on the purchase. Choosing a stair lift can be an overwhelming task, especially with so many options out there. However, by following the steps above, you should be able to land on the right decision in no time. Do you have any questions about choosing the right stair lift? Let us know in the comments section below!